The perfect addition to your reminiscing program! Questions like: Did you play sports in school? or The funniest thing that happened in school? 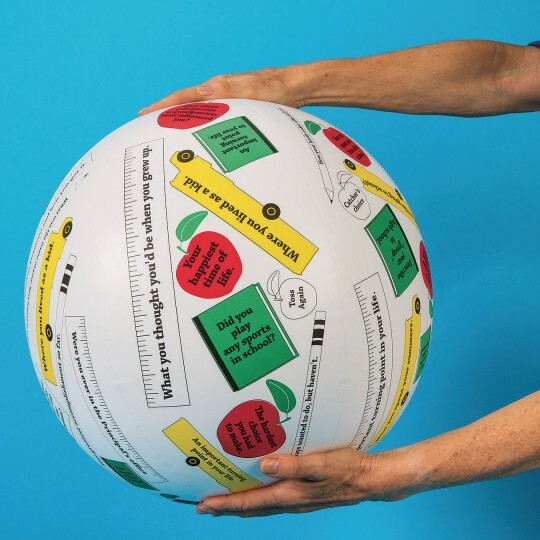 The perfect addition to your reminiscing program, this discussion ball also has the added benefit of some physical fitness — and a whole lot of fun! This Toss ‘n Talk-About® Ball features over 50 discussion prompts or questions about school days (such as "Did you play any sports in school? ", "A memorable summer vacation", "The funniest thing that happened in school"). When the ball is caught, the player answers the question that has been selected by the position of their thumb. Perfect for one-on one sessions or group activities and easily adapted for all age and functioning levels. 24" ball also includes a handy activity sheet with ideas for play and a repair patch.